Nov 4, 2015 › Categories: Got Beer? The world of beer is about to change. In the last Superbowl, Budweiser ran an ad called “Brewed the Hard Way,” which took a pot shot against the snooty nature of craft beer while touting its fine beechwood aging process. 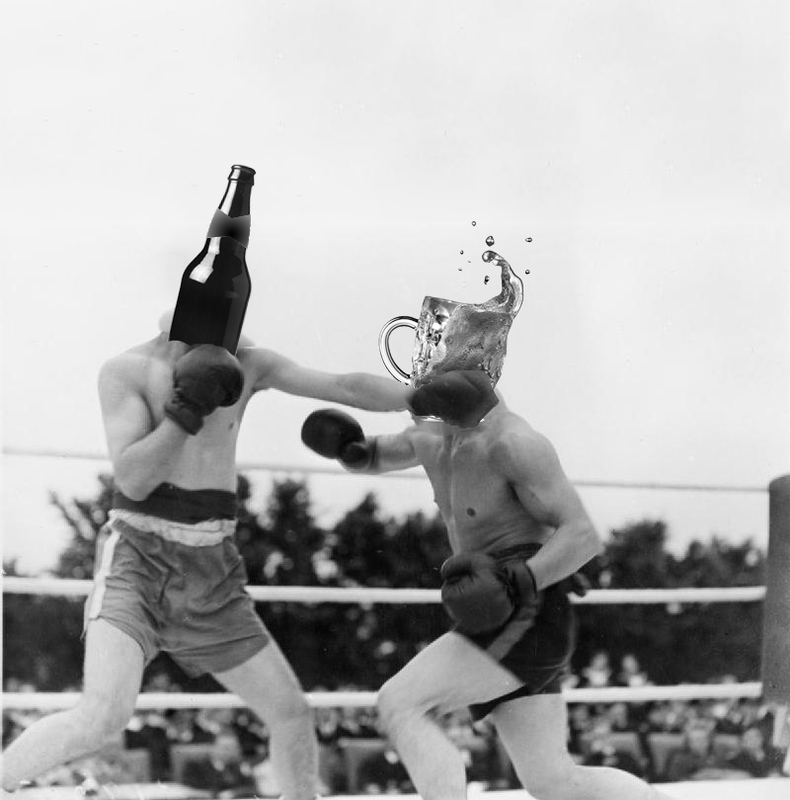 Many in the craft beer industry saw this as the opening volley in what could become a serious battle of beer. The main thing I took away from it was that Budweiser just did the worst thing you can do: Punch down. Comedians will tell you never to punch down. It’s okay to make fun of people better off than you, or in the same situation, or even yourself, but never someone who is lower or worse off. Punching up is comedy. Punching down is bullying. To be fair, this isn’t the first time Budweiser leveled its guns at craft beer. Ask anyone at Dogfish Head, Lagunitas or Sierra Nevada and they’ll have at least a few stories to tell. AB-Inbev’s bid for acquiring SAB-Miller is moving forward. The two companies are ironing out the legions of logistical and legal details, but it seems Budweiser and Miller-Coors are going to be merging into one massive, uber-powerful beer conglomerate. This comes right on the heels of a Justice Department investigation into AB-Inbev buying up distributors in order to prune off craft beer competition. Even if the DOJ can put a stop to this practice, the merger with SAB-Miller will create an entity so large that it will have to sell off smaller parts of the company to exist under American anti-trust laws. It may have to sell off the Miller-Coors brand, but even if it does that, the behemoth may be too big to stop. The one thing keeping the beer world in relative peace was that Budweiser’s rival, Miller-Coors (who merged into one company back in 2007), was just strong enough to oppose any large, open moves to strangle the beer market into submission. With that obstacle eliminated, craft breweries running on a shoestring budget might find themselves with no distributors, no shelf-space, no access to tap lines, and a thick, difficult bureaucracy to muddle through. Budweiser has long had an antagonistic relationship with craft beer, more so lately, as craft beer has taken a full 5% of the American beer market away from them in the last five years. That’s significant enough that the company needs to take action. Craft breweries are nipping at their heels. One can’t really blame them for doing something. Unfortunately for Budweiser, while they did experiment with faux-craft brands like Shock Top, they failed to win over the craft beer world. Bud’s long antagonism with craft beer has actually worked against them in this respect. Passionate, talented brewers generally won’t seek out Budweiser for employment. It’s just the nature of the craft brewer’s independent spirit. Why work for a brewery that wants to make a single kind of beer, and only a single kind of beer, when you can be free to experiment? Ironically, the local Budweiser distributor, Maclaughlin and Moran, has been tremendously supportive of local craft beer. An independent, family-owned company, Maclaughlin and Moran has been successfully distributing Budweiser and its various products for a long time. While they conform to many of the standards set in place by AB-Inbev regarding the Budweiser brand, they are their own independent entity. Their ‘Elevated Spirits’ portfolio of craft beer includes local favorites like Grey Sail and Revival as well as larger brands like Ithaca and Heavy Seas. I’ve seen them work passionately to get these beers out into the market, and help them thrive. They’re also a huge supporter of Beervana, the GIBF, and most of the well-known beer events in Rhode Island. The people who work there are dedicated and passionate. Rhode Islanders are fortunate to have both a very strong craft beer scene and laws that, while difficult and labyrinthine, actually serve to protect and nourish small breweries. Preventing stores like Walmart from carrying beer forces people to seek out liquor stores that can carry a large selection, offering a number of alternatives to mainstream, corporate suds. The laws are always being scrutinized, re-worked, and improved to help grow one of the few thriving local industries. Economically, small local breweries are a boon to RI, and we’re lucky to have independent distributors that are eager to help it grow. If this new Budweiser powerhouse turns its guns on craft beer, it will have quite a fight on its hands. However, I’m optimistic. A company as big as the one this merger will produce will have vast international markets open up. New markets in Asia and Africa could fill that gap in sales that craft beer is taking away. Just like when Lagunitas made a deal with Heineken, the merger seems to be more about moving globally than fighting locally. As it is, if the company sells off half the brands it acquires, but keeps access to foreign markets, then there’s really not a lot to worry about. Still, one can’t blame craft beer for being a bit nervous. The big guy’s punched down a few too many times.